Milan 2010: German designer Stefan Diez launched Eugene, a veneered plywood lounge chair for German brand e15, at the Salone Internazionale del Mobile last week. Like Diez's Houdini chair launched at last year's show (see our earlier story), the lounge chair is made of oak-veneered plywood bent around a solid base. Diez showed two versions of the lounger alongside bar stools also developed for the range. The German premium brand e15 stands for modern design, high grade materials and innovative, handcraft production methods. The new releases at Salone del Mobile 2010 emphasise these principles. E15 continues its 15th anniversary celebrations with new product launches at Salone Internazionale del Mobile. Alongside showcasing a comprehensive collection of private and contract interiors, e15 presents new seating furniture by designer Stefan Diez as a further development of the dynamic CH04 HOUDINI chair family. With the design of a new sofa, two different lounge chairs and a bar stool by Stefan Diez, e15 presents inspired and diverse seating furniture complementing its collection of interiors. A new sculptural table by creative director Philipp Mainzer depicts a stimulating contrast to the abstract organic forms by Stefan Diez. The new table by Philipp Mainzer reflects especially the e15 design language of minimalist, sensuously refined, enduring furniture. At Salone del Mobile e15 will launch its new products at the main fair with a special anniversary exhibition design reflecting a creative work environment, emphasising a studio character with displays of products, material samples, development images intended to show the continual design process the brand lives. A different selection of the new products will also be presented at e15’s showroom in the design district Zona Tortona on Via Tortona 31. E15’s anniversary illustrations are by New York based artist Mark Borthwick. With e15’s chair family CH04 HOUDINI by Stefan Diez, the German brand brought to life a new material and form language for chairs in 2009, which has already received international recognition being awarded the Red Dot Design Award 2010 and the Interior Innovation Award 2010. From the continuation of this creative collaboration with Stefan Diez, e15 in 2010 presents a new family of seating furniture, which is in its unique form and material a direct development of the CH04 HOUDINI. With the sofa SF05 BESS, the small lounge chair and stool EC02 BESSY, the lounge chair EC03 EUGENE as well as the bar stool ST10 JEAN, e15 presents seating items that are modern and enduring in appearance, deceptively strong and light in technique, which suit diverse interiors as either individual pieces or in combination with other e15 furniture. All new seating products are available in the CH04 HOUDINI colours, signal white, traffic grey, jet black and clear lacquered oak. For the first time at Salone del Mobile 2010, e15 will present the new bar stool ST10 JEAN and the lounge chair EC03 EUGENE. Based on the innovative bent construction of the chair CH04 HOUDINI both new pieces draw on form details of the chair. Made from oak veneered plywood sheets, which are bent by hand around a milled solid wood base, the bar stool ST10 JEAN consists of a seat with circumferential brim, which provides comfort when seated. Only between the front two legs runs a cross beam with an embedded steel profile, which acts as a foot rest and gives the stool stability. Available in two different heights, ST10 JEAN is suitable for contract as well as private use at a kitchen counter. Upholstery of the seat is possible. 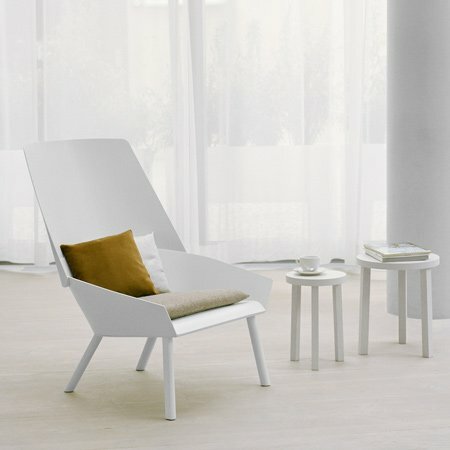 The generously proportioned lounge chair EC03 EUGENE exudes lightness and leisure with its high back, wide, deep seat shell and sloped back legs and presents the modern interpretation of a classic lounge chair. Also made from flexible oak veneered lacquered plywood, the lounge chair with its round bent wooden back offers ample comfort without padding. For additional comfort and style, the versatile lounge chair can be complemented with the seat and head cushions CU06 NIMA, CU09 EUGENE S and CU10 EUGENE H. Fixed upholstery of the seat is also possible.